Floods and wildfires are arguably the two most common disasters Coloradans face with numerous such events occurring each year. To better prepare residents for the danger of these disasters, this week is Colorado Flood Safety and Wildfire Preparedness Week. Each day this week the National Weather Service will be posting public information statements covering a number of different topics about floods and wildfires. These important messages should be required reading for all Coloradans so they know what to do to prepare for these events and handle them when they occur. ThorntonWeather.com will be posting each of these messages as a service to our readers. Check back each day for a new topic. Flooding can be a major problem in Colorado as we experienced in September 2013. Heavy rain fell over a large area of the foothills south to the Pikes Peak Region, resulting in flash flooding. Much of the water that fell across northeast Colorado eventually ended up in the South Platte River, with major river flooding having occurred from Greeley to the state line. River flooding can result from heavy rain during the summer and from rapid snow melt or thunderstorm rain combining with runoff from melting snow. 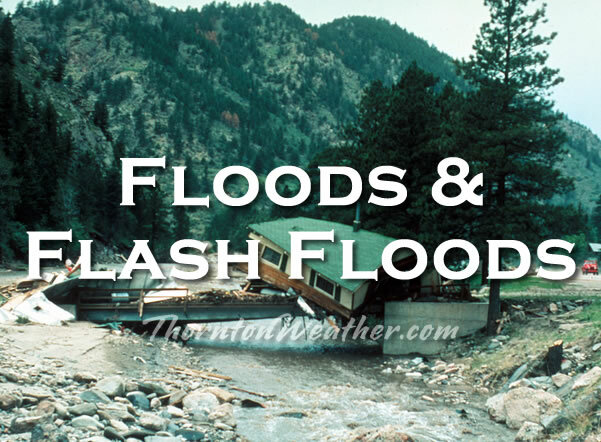 Flash flooding refers to a dangerous sudden rise in water within an urban area, in a canyon, or along a creek or wash over normally dry land area. Flash floods result from heavy rainfall, sudden breaks in river ice jams, and dam or levee failures. Flash floods can occur within a few minutes or hours, and can move at surprisingly high speeds, striking with little warning. Flash floods are quite destructive because of the force of the moving water, and the debris that accumulates in flood waters, such as trees and boulders, which can destroy roadways, bridges and buildings. Another complication in Colorado is the serious flooding that can result when heavy rain falls on recently burned areas. Anyone living downstream from a recently burned area should be aware of the changed conditions, which result in much faster, turbulent, debris and ash clogged waters from the burned area. The National Weather Service will discuss flood and flash flood potential in daily Hazardous Weather Outlooks and in the graphical weather story on National Weather Service websites. On days with a high threat for flooding, you may hear of a Flash Flood or Flood Watch, which means that flash flooding or flooding is possible within the watch area. A Flood Warning means that flooding is imminent or has been reported along a river. A Flash Flood Warning means that flash flooding has been reported or is imminent. When a Flash Flood Warning is issued for your area, act quickly. If advised to evacuate, do so immediately. Go to higher ground or climb to safety before access is cut off by flood waters. Go Up, Not Out. Nearly half of all flash flood fatalities are vehicle related. Do not enter a flooded roadway, instead Turn Around…Don’t Drown. In rapidly rising waters, backing up away from water would be safer. One to two feet of water will carry away most vehicles, and you also cannot tell if the road is damaged beneath the water. More information on flooding hazards can be found on the National Weather Service Flood Safety page here. Colorado Flood Safety and Wildfire Preparedness Week continues through this Saturday. This entry was posted on Monday, March 4th, 2019 at 3:20am MDT and is filed under Weather Education. You can follow any responses to this entry through the RSS 2.0 feed. You can skip to the end and leave a response. Pinging is currently not allowed.